Jaguar has had a chequered history up to the present. Starting life as a motor cycle side car builder, they moved on to custom coach building on some of the UK’s more popular chassis. Until eventually in 1948 they rolled their first all Jaguar model off the production line. Simply known as the SS, it captured the imagination of post war British motoring enthusiasts and the rest, as they say, is history, Good AND Bad!!! This model is huge! What do I mean, huge, that’s what I said. Not so much big, as......... huge! By regular slot car standards it has a very large ‘footprint’! At 64.0 mm, the rear axle is one of the widest I’ve seen outside of LMP models and the ground clearance is just so low. Even the front air dam barely misses the track, but that’s not why I bought it. For those who read other parts of the forum you’ll remember me making a complete a**e of myself and vowing never to buy one because it had ‘stick on’ headlights!! Well, I relented. On a recent visit to Red Racer I couldn’t help admire it. I was looking for the yellow and silver version but was told that the few they had were quickly snapped up. The yellow and silver ones ARE attractive and my decision was more based on the fact that I would see a yellow and silver one more easily in some of the more obscure places of the tracks I race on. 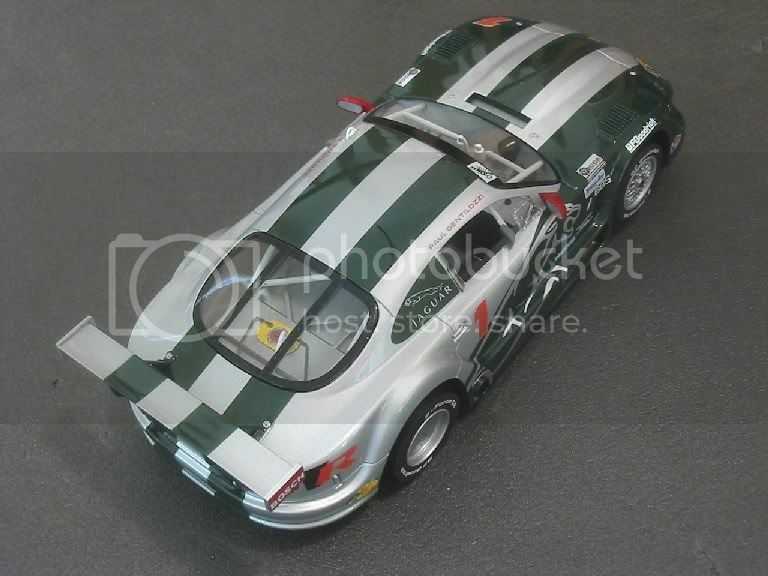 But, there in the showcase, was the Gentilozzi car in all its green and silver. A bit like the last puppy in the pet shop window at the end of trade on a Saturday, soulfully looking up at me (or rather me at it!). Fighting back the emotion, I croakily said, “I’ll take that one” thinking it to be the last. Thirty seconds later, Adrian returned with a box of half a dozen and said something like, “Funny, you know. I sold all the yellow and silver ones straight away, yet I’ve still got boxes of the green and silver ones”! I do get sucked in easily! Anyhow, I don’t regret a minute of it and as I look at the model on my hobby bench I am drawn closer to the leaping Jaguar on the sides and rear side glasses and the bold paint job too! Once again the tampo is faultless as we’ve come to expect from Hornby (complete with stick on lights) and the detail is becoming a true work of art. First things to be noticed are the robust air dam at the front. It’s going to take a serious front ender to mark this, but the etched grille in the front looks like it could be a potential casualty at the drop of a hat. Always check for its presence when retiring it from the track! Moving towards the back brings me to the door mirrors, another source of worry for the timid driver, but, what’s this? The outer door mirrors (I say outer because there are some inner ones too!) are made of what looks and feels to be a polyurethane type material. Moulded in red, they are decidedly bendy!! Not as bendy as the Nissan JGTC but definitely bendy. This bodes well for some door slamming action. There are also a lesser pair of mirrors attached to the roll cage. These are well inside the roll over zone and should be safe. That is until you are ‘T’ boned through the window in a multi car incident! As nice as it looks, I give the antenna a week and that’s being generous. I suspect that 90% of my models are minus their aerials, cleanly sheared of at the roof in a trice! 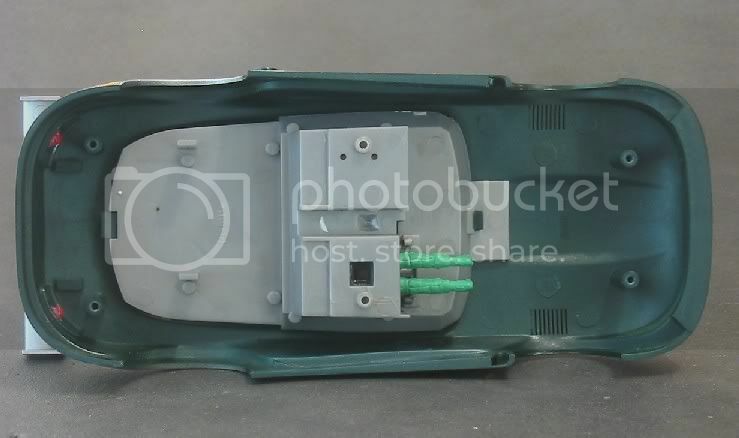 In die cast model circles, it is possible to buy after market antenna mouldings to help restore models to their former glories but as yet, I haven’t seen any generic antenna for slot cars on eBay or elsewhere for that matter. Perhaps there’s a niche waiting to be fulfilled!! Moving further back we come to another worry, this is the rear wing! Beautiful in its representation but ooh so vulnerable. It looks sturdy enough but it is glued in. And the unsupported outer edges are asking for it. Tsch, Tsch, Tsch! If Carrera can make their wings removable, what seems to be the problem here Mr Hornby? Moving on and in, the interior is another Scalextric masterpiece. Full dash detail front AND rear. A full competition roll cage and detailed fuel tank in the rear. 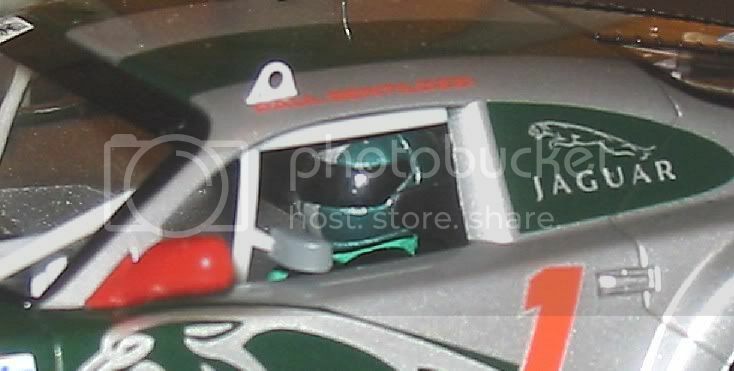 The driver too is looking relaxed in his little space and his helmet is one of the better modelled aspects. Just above the drivers window is what looks to be a lifting hook. I can only assume this is for the cranes to lift the car off the track in the event of a no brainer! Still, a very nice touch with a possible limited life. Underneath the model everything is very flat. Very.......... Mmmmmmm? V8 supercarish! Not a lot sticking out here, except the guide. The guide is quite wobbly and it looks like it is going to need a shim on the shaft to remove some of this wobble. The braids were a mess and had to be reset. Four screws hold the body on but there are a couple more in the middle which fix to the interior detail. All six will need to be undone to release the chassis. Looking at the inside of the chassis you could be forgiven for mistaking it for an Aussie V8 chassis. Very wide, very plain, very functional. The slot guide support looks a bit vulnerable and I can see a few requests for chassis’ in the near future. There is a lot of worrying flex too. Front axle is basic and functional. Fixed in place again like the V8’s but again, the mounts look a little flimsy!! Moving further back we have the magnet. Nothing new here. A good wide neodymium which, after a bit of tyre wear, will pin this sucker to the rails!! Then comes the motor. The usual Mabuchi ‘S’ can but once again, the mounts look terribly thin. This also is very flimsy and reminiscent of the V8’s, only with the V8’s it has been noticed that models that race on old and bumpy tracks with the body loosened soon snap the rear chassis across the thin bit of land which passes under where the motor sits!! The rear end and axle are in danger of becoming detached in a good stiff shunt! It may be necessary to run this model with all screws tight to reduce the risk of the chassis breaking under the motor ‘a la’ V8’s! Next is something else a bit unnerving. When I tested the rear axle for side play it was negligible. 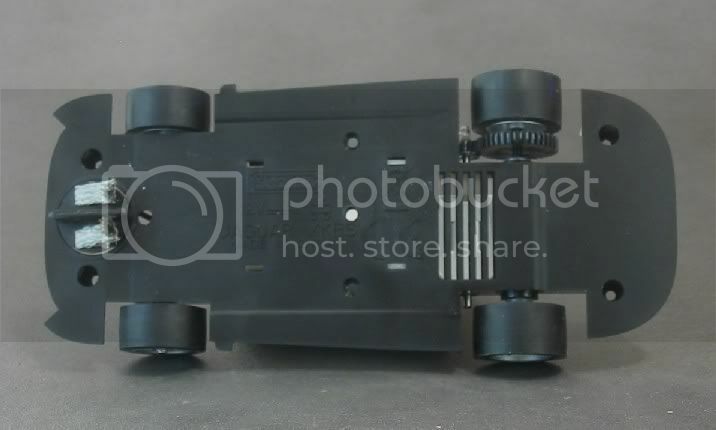 This surprised me as these models ALWAYS have side play, and on further inspection it was revealed that the only thing stopping the rear axle slopping from side to side was the flange on the pinion pressing against the spur gear, thereby pretensioning it against the right hand rear axle bush! In right handers, centrifugal force causes the axle to push against the pinion flange and in turn push the motor shaft into the motor. Now, I know there is a collar inside the motor which limits the armature’s travel, but all the same, I would much prefer the rear axle to rest against the axle bushes in a cornering situation. Time for some of my special washers I think!! Also, I spot that the motor has some linear movement in its mounts!! What’s happening Mr Hornby? While I had it apart I glued the motor in situ with some PVA glue and popped the axle out and fitted a 1.5mm split shim between the spur and the left hand axle bush. Now the axle and spur are free from exerting side-on pressure on the motor. This might well impact on its initial track testing so I might have to go straight to stage two! 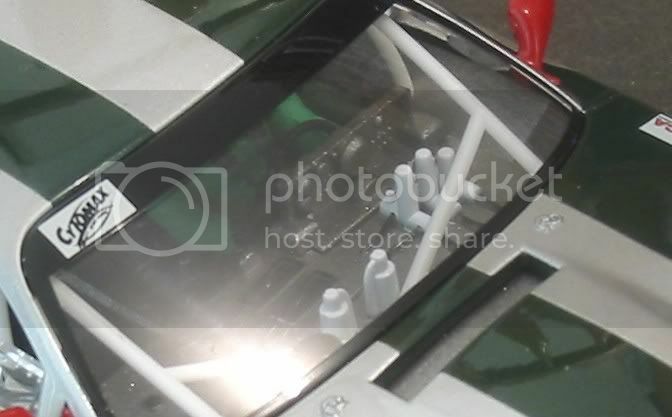 The body mounting posts sit in a recess in the top of the chassis screw wells. They don’t seem to be a tight fit but I’ll be looking out for them when the time comes to tune the body. Finally, the wheels and tyres look great. No flash or sprue remains on the wheels and the tyre mouldings are very concentric. The slightly convex tread surface shows that there isn’t going to be much rubber lost when truing these beauties. On closer inspection, the wheels also look flimsy!!! The centre boss which is the axle shaft hole has no reinforcement webs around it. The boss goes straight on to the spoked part of the wheel and it is only this which holds the wheel true. Again, not much meat round these parts. It looks like extra care is going to be needed when changing tyres or simply sanding them!! This could well be another source of failure. The word flimsy has occurred several times already and after reading the text over again I can’t think of a better word to replace it with!! So the warning is that this model may well be vulnerable in a fray!! Wheels need protecting and, with a heavily campaigned model, the rear chassis could let go, I hope I’m wrong! Lastly, before running it at all, and as I had altered the rear axle and motor mounting, I decided to carry out the rest of the basic body tuning steps. What do we need to do; well this is what I did to the basic set up. First for attention was the guide. The side to side slop is a bit much and even though the downward pressure keeps the guide flat, it is stretching the imagination to think that during hard cornering it will stay that way. The guide retaining screw was removed and the amount of guide spindle protrusion was noted. The guide was slid out and with a modellers file I removed a little less than the protrusion. The guide was refitted and the screw retightened and sure enough, the side play had been reduced significantly, more in line with the rest of my racing models. I note that the front wheels barely touch the surface of my test block when in the slot! On Scalextric classic and SCX track with the raised conductor rails the front wheels are going to be hanging under the car! As the axle and motor play have been dealt with the last check is the chassis / body fit. 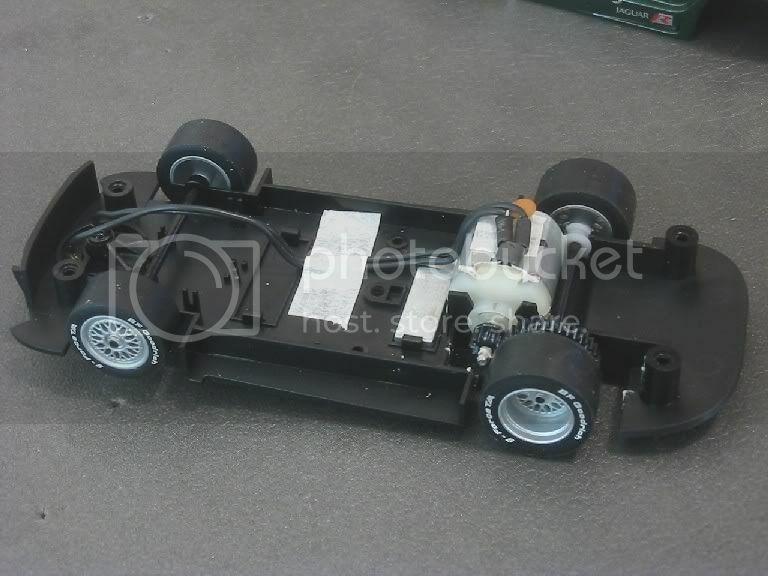 The chassis is a very good fit in the body and has a working clearance barely visible. To achieve a semi floating body is relatively simple. Firstly, I increased the diameter of the holes in the chassis screw wells. This reduces the incidence of the screw threads biting into the chassis material and holding it even when the screws are slackened. With the chassis back in place, the driver’s tray screws were fitted. It was soon apparent that these miniscule screws were going to hinder body movement no matter where they were set. The final decision was to leave them out altogether! The driver’s tray is traditional Scalextric and it clips in via a body clip front and rear. 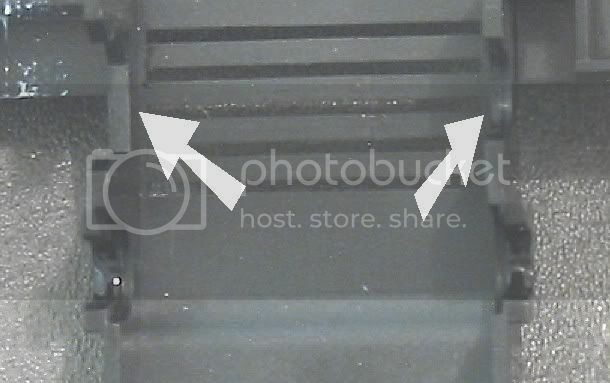 The tray also holds the clear parts in. Although these clips look reasonably good, I decided to put a spot of PVA on both clips and a couple of beads down the sides of the tray to be safe. Now the chassis was refixed and the screws backed off to allow about one millimetre of up and down movement at the front and rear. This will be a starting point for the track test. I took the first opportunity to run it on my neighbours classic Scalextric track, this is a demanding but flowing scenic layout which includes most of the sixties features, the hardest being the Goodwood Chicane. I set off and started to put some hard work i9n almost immediately. The Jaguar is very quick and before long I was doing 7. 4’s. Pushing harder in the bends saw the back step out and an oversteer deslot ensue. This happened several times more before I decided to sand the rear tyres. The running marks showed the tyres to be convex and after a little sanding a flat tread was created. Setting out again, I was now able to give the model flat chat once in the bends and this was the case in all corners except the double inner curves. The average lap times dropped to 7.1’s and within no time I had cracked the seven second barrier. I gave the rears another short sand and chamfered the outer edges slightly and set off once more. After another twenty or so laps the best time was down to 6.893 seconds. Any improvement at this stage was going to be minor. So with the model in stage two trim it will soon be time to run it through the hoops on Red lane of the Red Teams home track. I’ll say it now; I have high hopes for this model! The model’s next outing was to be at Red Racer Hobbies six lane Carrera circuit. Before the evening became too chaotic I managed to put in some useful laps. Models racing on Carrera need a lot of attention paying to tyres and magnets because the stainless steel rails don’t offer as much magnetic adhesion as other makes. I started to doubt the quality of the tyre rubber compound as the model span out freely and frequently. Sanding and cleaning made little long term difference and after twelve or thirteen laps the model was back to normal, sliding and spinning on this very fast circuit. A fellow racer lent me his silicon shod Jag for a few laps and the difference was chalk and cheese. The Jag tyres are not happy on smooth, low down force plastic tracks. It maybe the compound but then again it may be the very wide tyre profile. Excessive area will spread the amount of available friction over a wider area reducing its effective grip per square millimetre! So it looks to be a tyre job but there is one more track to test. Back at the Red Team’s home track , after an hour or so’s racing, I put the model on for a test run. The computer timer was reset and I pushed off at a pace. 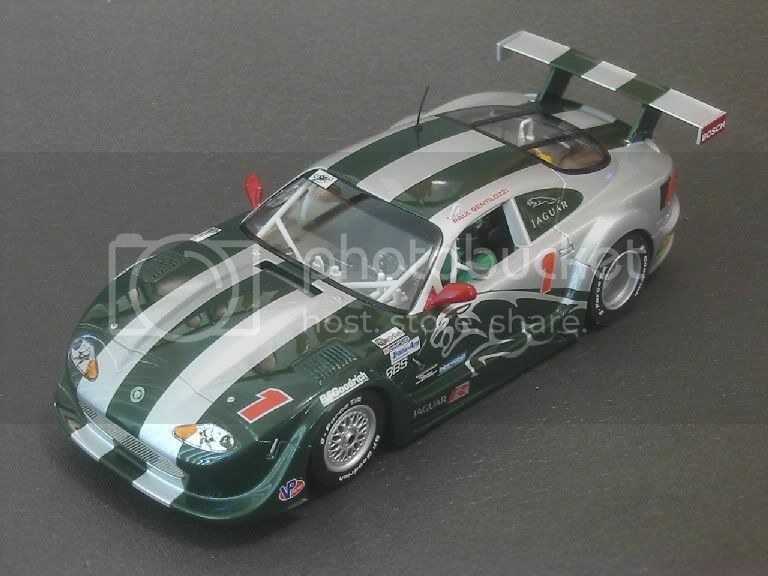 The model is very quick off the mark and displays some V8 Supercar characteristics. Snapping the throttle open quickly at the exit of bends will see it leap from the slot and career down the track out of control. It is going to need some serious ballast forward of the motor to tame this. Further driving saw the model to be a real handful and once again after a few laps the tyres seemed to go off. Fishtailing and snaking up the straights. Cleaning the tyres with Shellite (hydrocarbon) regularly seemed to be the only solution. I have experienced poor tyre quality across most makes of slotcars in the past. The first instinct is to replace them with some other make but I have also found that a new set of the same tyre can solve the problem? It is unlikely that the model tyres have ‘gone off’ whilst in storage on the model. A more feasible explanation is the mixing of the rubber compound at the manufacturing stage. Tyre rubber is a compound of probably a dozen or more components. As with a lot of the chemicals industry, this compound is mixed in vats of probably 500 to 1,000 litre quantities and the compounds is monitored by a quality assurance process through all stages to ensure the batch is identical to the original tried tested and approved sample. A variance in tolerances for practical reasons is allowed and if one or more chemicals added are at the limit of the tolerance it is not unreasonable to expect the batch quality to sit on the edge of its specification. In the case of rubber compounds it may well be the difference between a model tyre that works and a model tyre that is hard work. So, back to reality and eventually I settled for a poor 7.583 second ‘best lap’ The tyres will be getting a severe scrutinising and it may be hard to find tyres this wide amongst the after market tyres available! Well I am glad I relented and bought this model even with its tyre issue. It fits nicely into a new class which is being raced locally and is certainly on the pace with the other 18,000 rpm ‘S’ can models on Scalextric track. The model’s wide footprint ensures its stability in corners and it is only a case of matching the tyres to the track surface where you are racing to finish the model. The fact that it carries a lot of weight in the rear is in its favour on most surfaces and it is only the non magnet venues that the rear tyres need to be up to scratch to prevent some heavy fishtailing and some ballasting further forward to keep it in the slot. For me this is another ‘must have’! Make it yours too! But work on those tyres!